The Lower Ab Plank is a variation of the toughest move in the Pelvic Tilt Progression so do not attempt this move if you haven’t mastered the other levels of the Pelvic Tilt or feel this move in your low back when you try and do it. To do the Lower Ab Plank, lie on your back with your arms down by your sides. 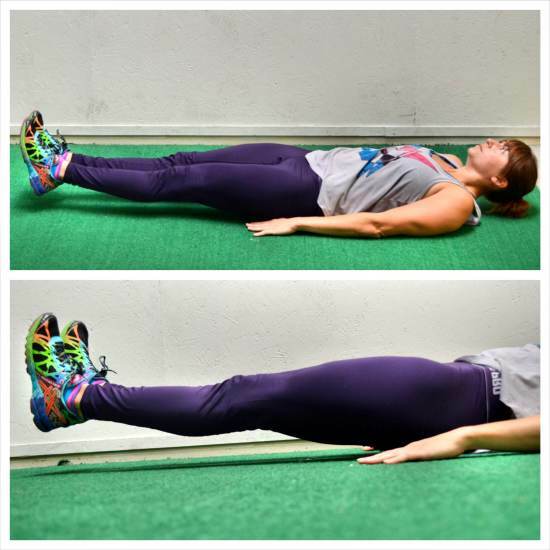 Raise your legs straight up toward the ceiling and press your low back down into the ground. Then lower your legs down so they are only an inch or two off the ground and hold. You will hold here until the time is up. Engage your abs and your glutes and prevent your low back from taking over. If you feel your low back taking over, raise your legs up higher or slightly bend your knees. You can also do another variation of the Pelvic Tilt and progress from there. For the complete Pelvic Tilt Progression, click here.